If you come in a Yukata, you’ll get 1 free drink! 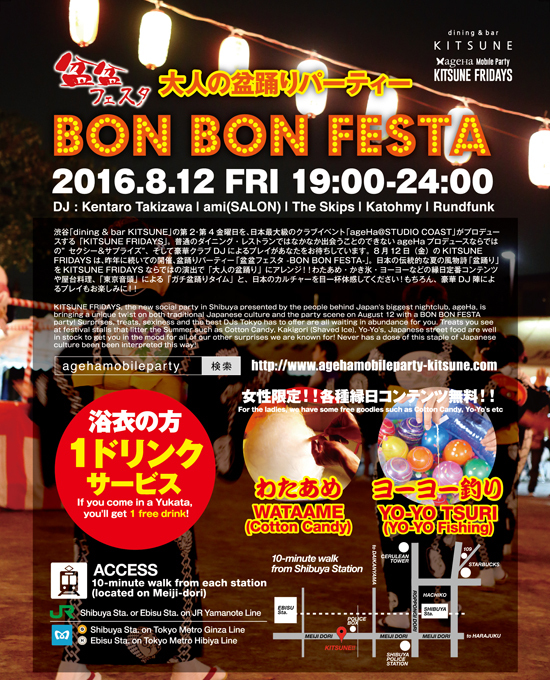 KITSUNE FRIDAYS, the new social party in Shibuya presented by the people behind Japan’s biggest nightclub, ageHa, is bringing a unique twist on both traditional Japanese culture and the party scene on August 12 with a BON BON FESTA party! Surprises, treats, sexiness and the best DJs Tokyo has to offer are all waiting in abundance for you. Treats you see at festival stalls that litter the Summer such as Cotton Candy, Kakigori (Shaved Ice), Yo-Yo’s, Japanese street food are well in stock to get you in the mood for all of our other surprises we are known for! Never has a dose of this staple of Japanese culture been been interpreted this way!